Drawing on tactics that saved thousands of Jewish lives during WWII, Danish activists are defying their government by providing direct service to asylum seekers. 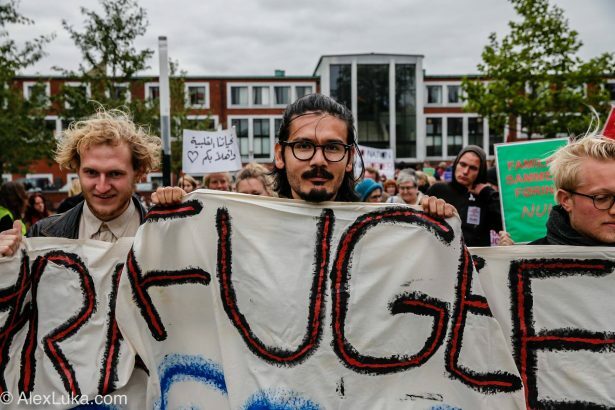 About 100 Danes, young and old, stood outside Copenhagen City Court in the chilly seaside winds last Tuesday to show their solidarity with four activists alleged to have illegally assisted refugees in their trek across the waters from Denmark to Sweden. While only two of the accused are Danish citizens, all are members of MedMenneskeSmuglerne, or “Those who smuggle thy neighbor” — an outgrowth of the more broad-based initiative Welcome to Denmark, which welcomes migrants and refugees into the country. While Danish prosecutors may not have agreed, their case was ultimately dismissed for lack of substantial evidence. The four members of MedMenneskeSmuglerne were met with victorious applause by their Welcome to Denmark cohorts outside the court building. When Trine Simmel, a young Danish activist from Aarhus, saw the masses of migrants on television pouring across the German border into Denmark’s Jylland peninsula around September 2015, she connected with her friends to figure out what they could do to provide basic needs to the newcomers. The migrants were being escorted by policemen into Jylland, so the youth initially planned to wait at an overpass, where they could drop care packages full of warm clothes, hygiene products and other essentials. The migrants, however, had become suspicious of being escorted by state authorities and dispersed themselves into the forests, which made tracking them much more difficult. A good number of the refugees decided to go to Copenhagen, just across the sea from Sweden, where some already had family members. “Many apolitical people stepped up to help drive those walking on the railways,” Simmel said. “Many of these people had family backgrounds as immigrants and felt empathetic, but were not usually active in political issues.” An informal hospitality network known as Venligboerne, which includes over 150,000 members across Denmark, helped facilitate the volunteer effort. 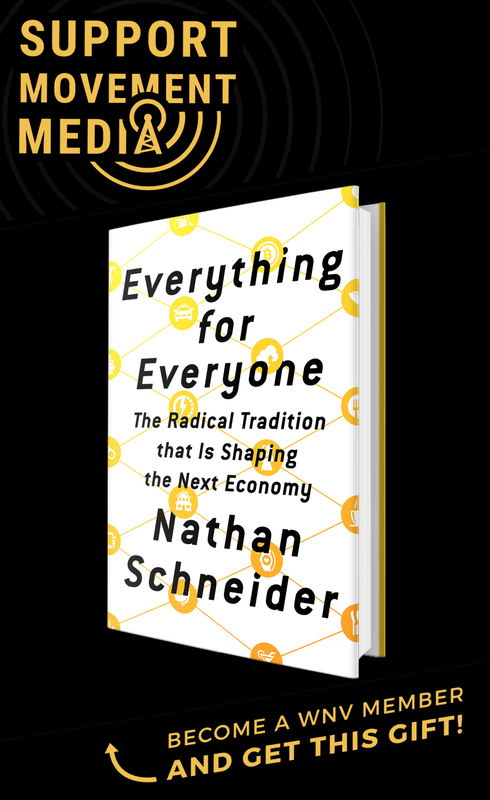 Activists like Simmel felt this crisis presented an opportunity to get away from the typical activist duties of meetings and demonstration, and provide a direct service. The influx of refugees tugged at their consciences. Denmark was the only country in Europe to reduce the size of its armed forces at the beginning of WWII, yet it was undoubtedly among the most effective in resisting German occupation. Danish youth discretely produced fliers of this kind over the course of the German occupation. Groups like the Danish Youth Association under the guidance of theology professor Hal Koch and the Churchill Club in Alborg sabotaged German authorities on a regular basis, sometimes destroying vehicles carrying weapons and munitions. Christian communities circulated messages against the German occupation through their homilies. This led to the murder of Kaj Munk, who was among the most outspoken clerics advocating for Danish self-rule. Among all of the tactics employed, the WWII-era Danes are perhaps most remembered for their effective smuggling of refugee Jews across the border into Sweden. During the course of a few months in 1943, 7,220 Jews — almost the entire Jewish population in Denmark — managed to escape to Sweden with the help of their Danish comrades. Only 472 were captured in early October during raids by the Nazis. “Early on, we used this history of direct service to refugees as our inspiration,” said Welcome to Denmark organizer Søren Warburg. Providing a warm bed, an underground route to Sweden, warm clothes and a key to one’s house: These are tactics literally cut from WWII memory and pasted upon today’s context of migration in Europe. Even while Denmark’s present government has intentionally made itself unattractive to asylum seekers, Danes themselves — strengthened by a history of unions and community organizing — are providing the services their elected representatives in the welfare state are refusing to provide. Reflecting on the history of Danish aid to Jewish refugees, Welcome to Denmark spokesperson Line Søgaard said, “We had a sense that something historical was happening again.” According to her, 500 Danes initially responded to the call to action and formed working groups, focusing both on a political campaign and direct services. 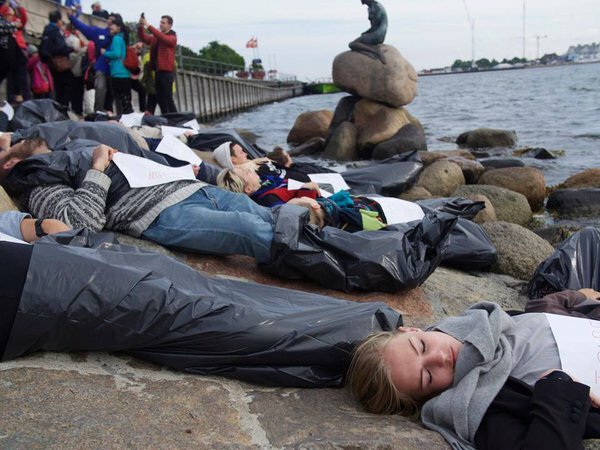 Since Copenhagen is situated about 20 miles across the Öresund Strait from Malmö, Sweden, members of the sailing community who wanted to help refugees find family members or friends in Sweden decided to take action. In October of 2015, they gathered a list of nearly 20 names of allied boat owners and organized the transport of migrants as a public act of defiance. Crossing by sea, however, wasn’t the only way to reach Sweden. Calle Vangstrup, one of the other four activists who faced criminal charges, worked with his movement members to provide around-the-clock assistance at Rødby, Padborg and Central stations — three major meeting points where migrants who are usually not conversant in Danish or able to understand the transportation system could depart for Sweden by train. Vangstrup believes members of Danish Nazi groups and the populist Danish Peoples’ Party were the ones who saw MedMenneskeSmuglerne on the news and reported them to the police. “As a socialist and as a human being, I feel I should not enjoy so many rights when the refugees have none,” Vangstrup said. Although the police carried out investigations leading to the charges against Vangstrup and his fellow activists last spring, police have not always perpetuated the xenophobia that characterizes the growing right-wing political ideology of Denmark. During WWII, thousands of police officers were arrested by German authorities. Danish cops had developed a reputation for being unreliable, often deliberately overlooking the acts of sabotage committed by Danish youth against the occupiers. After the four activists accused of human trafficking were relieved of their charges, they spoke at a press conference, encouraging those directly aiding migrants and refugees to continue their work. 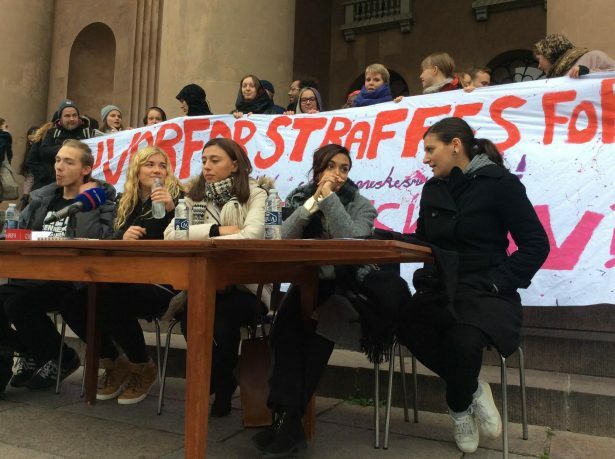 “We are not even a radical group,” Søgaard said. “We are just saying the same things that groups like the United Nations are saying [about the migration crisis]. Yet, there is still resistance to our efforts.” At the end of the day, these so-called human traffickers were just helping others in need with a lift to wherever they were going.